The great thing about sketches is they can be adapted to suit any theme and any colour combination. 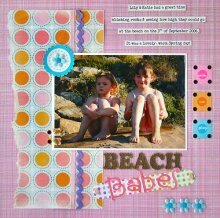 With this layout, Susanne shares with us her take on a Stickers 'N' Fun sketch from September 2006. This layout was created using Sassafras Lass In Stitches Tweedle Pink paper, Sassafras Lass Bubbly paper, white Bazzill cardstock, black eyelets, pink snaps, aqua snaps, Bo Bunny Press Melody Pink stickers, Hessian letters, Mauve ric rac, pink & white ribbon, blue flower ribbon, sea shells, sanding block and Doodlebug Bright Candy Tags stickers. Use Sassafras Lass In Stitches Tweedle Pink paper as the background. Measure a piece of Sassafras Lass Bubbly paper measuring approximately 15cm by 27cm. Tear down the longest side, taking approximately 2-3cm from the width. Distress by sanding edges of paper with sanding block. Attach ribbon vertically 4.5cm from right hand side of prepared "Bubbly" paper. Attach mauve ric rac on right hand side of ribbon. Adhere Sassafras Lass Bubbly paper vertically to the right side of the Sassafras Lass In Stitches Tweedle Pink paper. Mat photo with white Bazzill cardstock. Adhere photo so that it overlaps the Sassafras Lass Bubbly paper by 7cm, as shown in the layout above. Using a Xyron or glue, stick Hessian letters to the layout underneath your photo. Adhere "Doodlebug Bright" & "Bo Bunny Press Melody Pink" stickers underneath them, as shown. Tack in place, with super tape, blue ribbon flowers and set aqua snaps. Set black eyelets & pink snaps. Print journaling onto white Bazzill cardstock as individual lines, trim to size & adhere to layout. I have 8mm of space between each line and have used Acoustic Bass font. Last but not least, glue some shells to decorate the tabs on the left hand side of the photo.